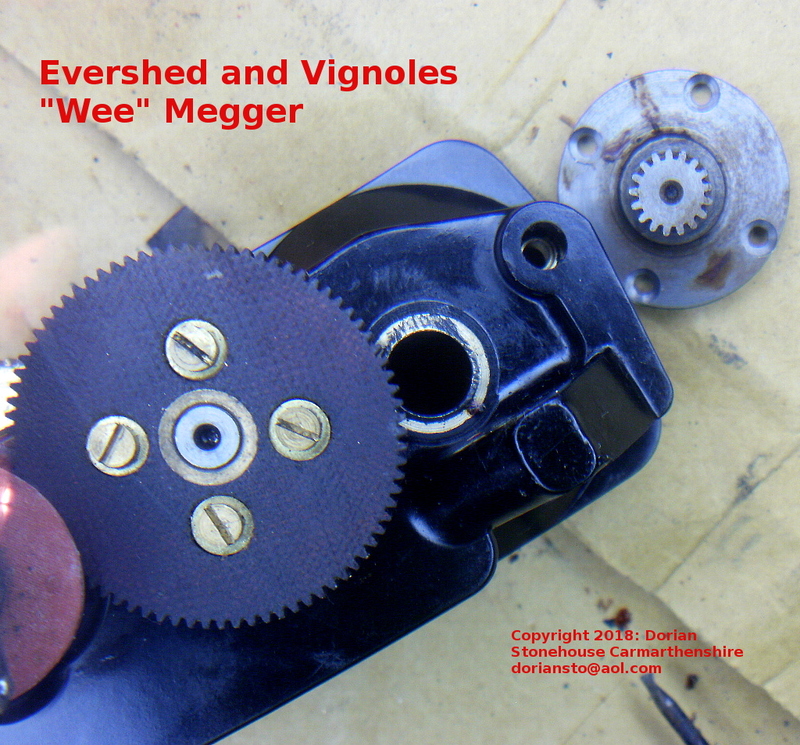 The most in depth look at the Evershed & Vignoles “Wee” Megger series 3 instrument ever featured online! 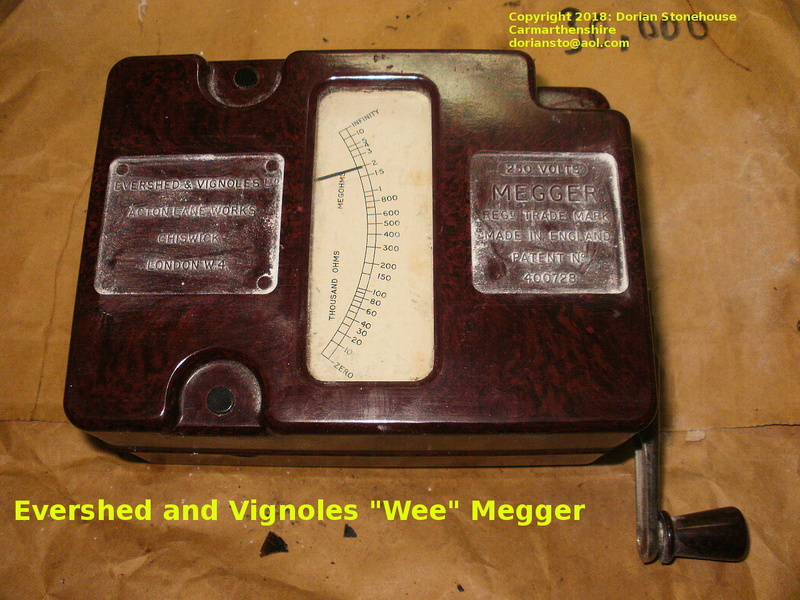 The “wee” megger was an ingenious insulation tester of yesteryear. 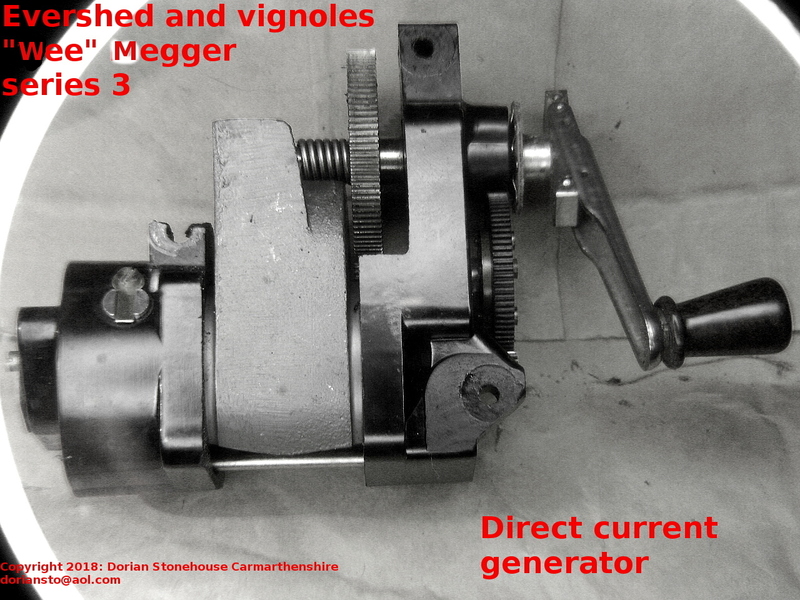 It consisted of a hand-cranked generator, a sensitive meter and associated components. 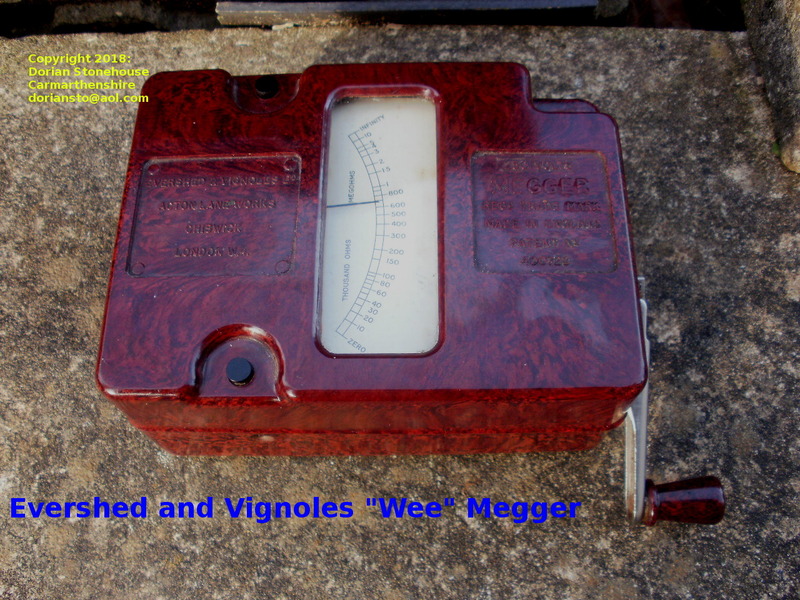 It was sold as a “moisture meter” – presenting a high voltage low current source across the appliance under test. 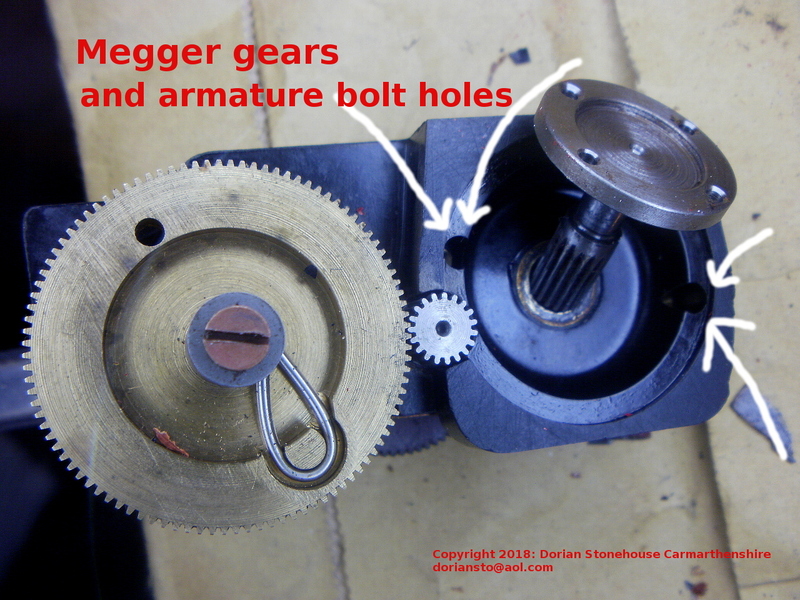 There are many descriptions online on how the megger works, and the following explanation is just my take on things. 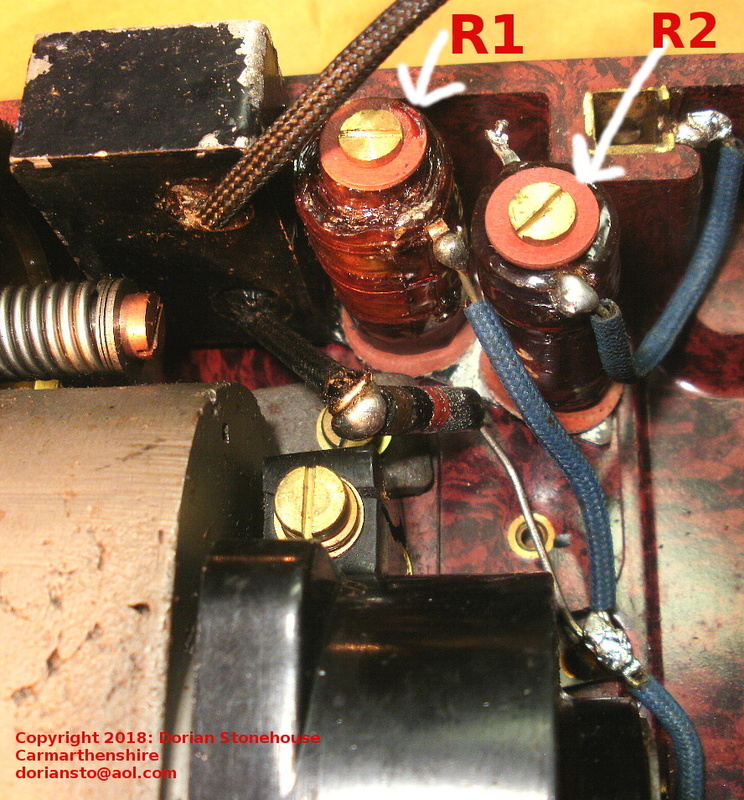 As soon as the generator is cranked, L1 (in series with R1) are across the generator supply voltage. 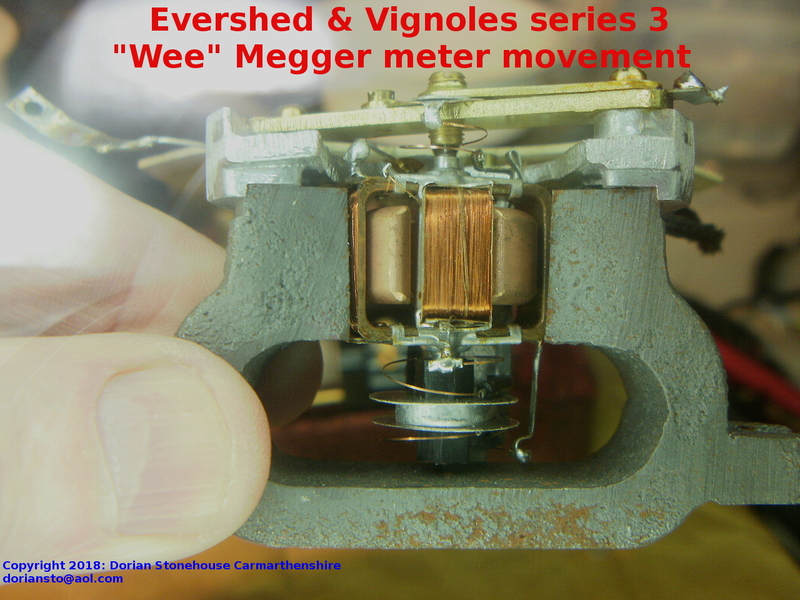 The most in depth look at the Evershed & Vignoles “Wee” Megger series 3 instrument ever featured online! 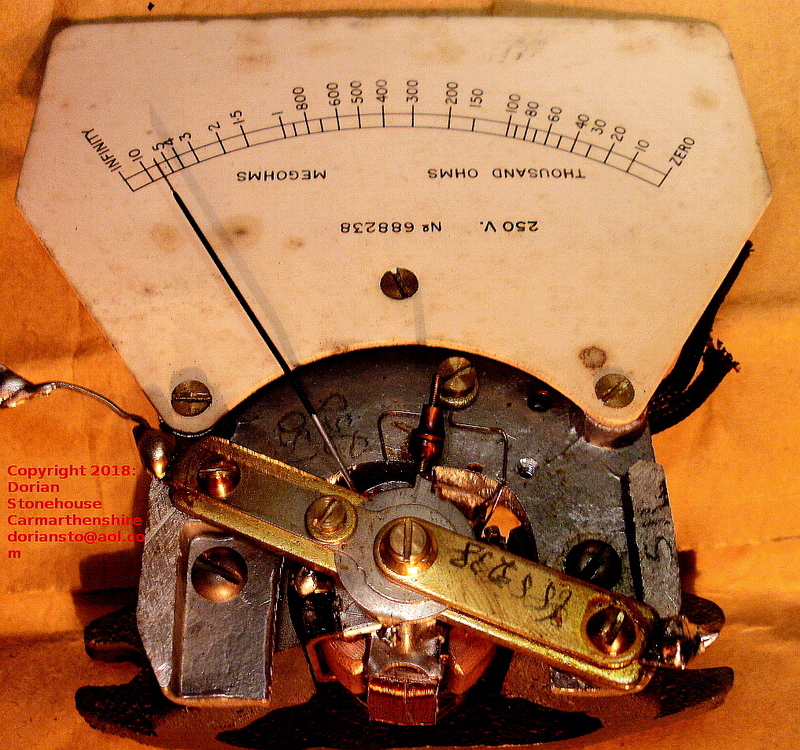 Possibly the most in depth look at this instrument ever featured online! 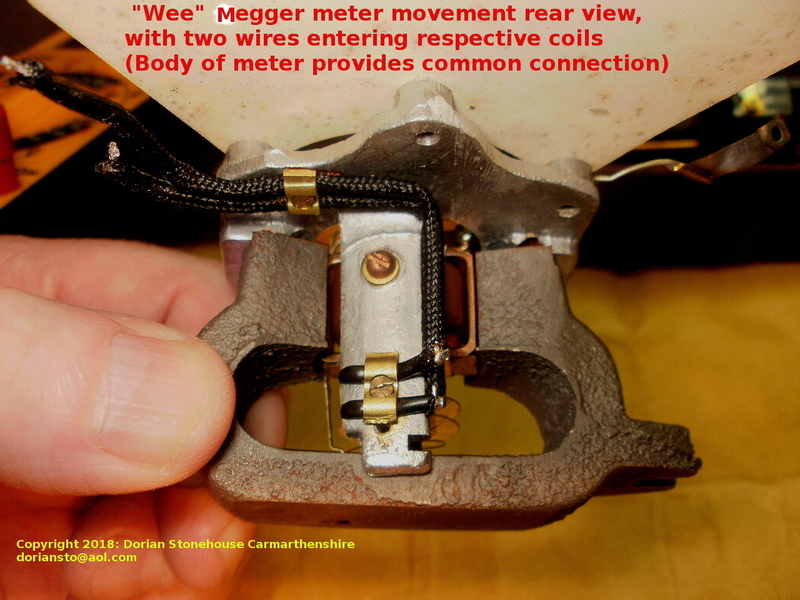 When a tiny current flows through my finger and L2 (VL2), the meter needle swings to the right – short circuit direction. (See “zero” on above scale). L1 and L2, therefore, work in opposition. 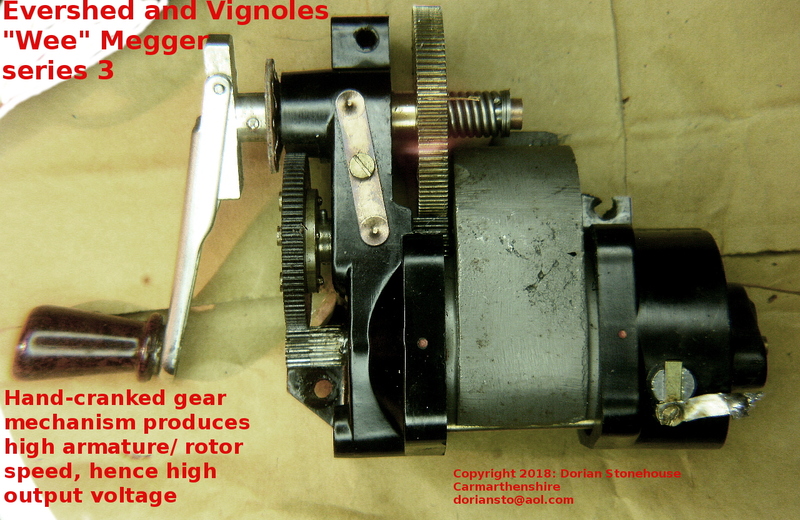 When the generator is cranked, VL1 is higher than VL2. L2 is now in series with a very high resistance – the appliance under test . 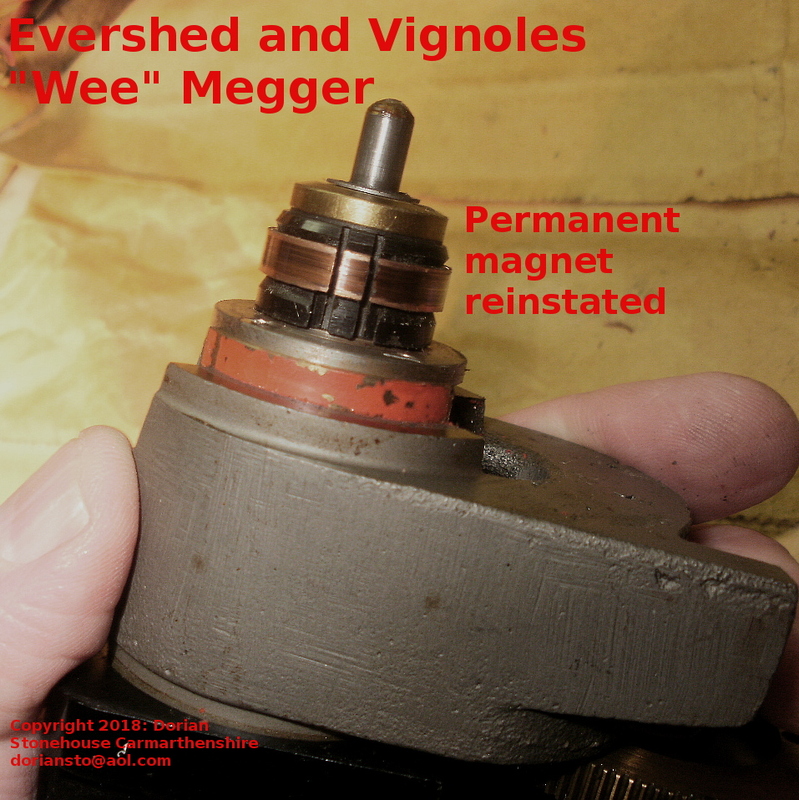 With no current flowing through the appliance under test (no leakage), VL2 will be very small. 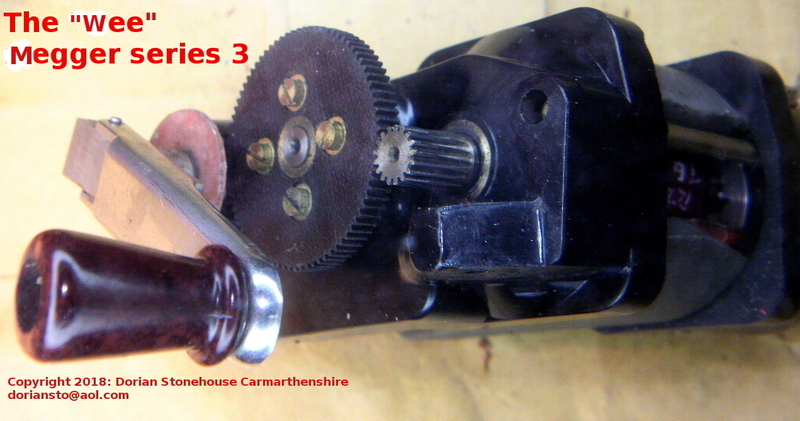 VL2 cannot, therefore, push the needle to the right. VL1 wins the match, pushing the meter needle towards “infinity” – left. 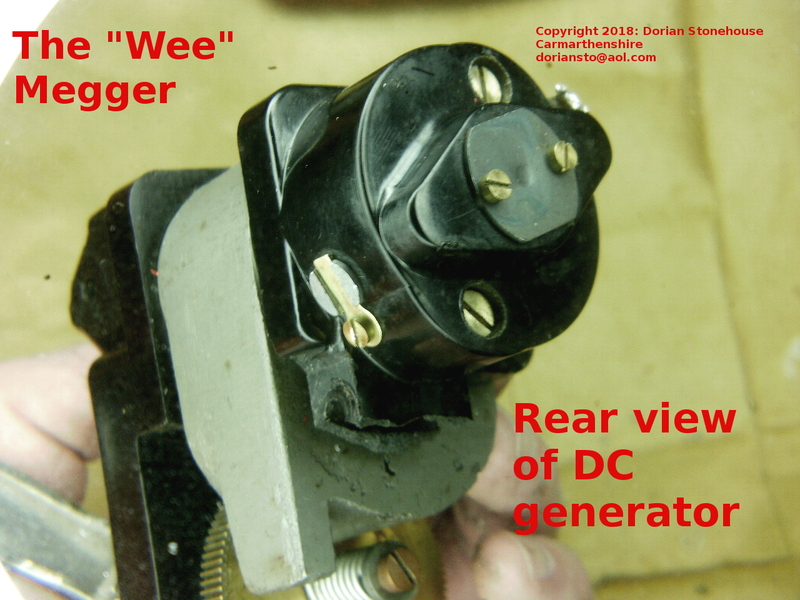 When the generator is cranked, if the appliance under test is short circuited, coil L2 now senses a higher current through it. 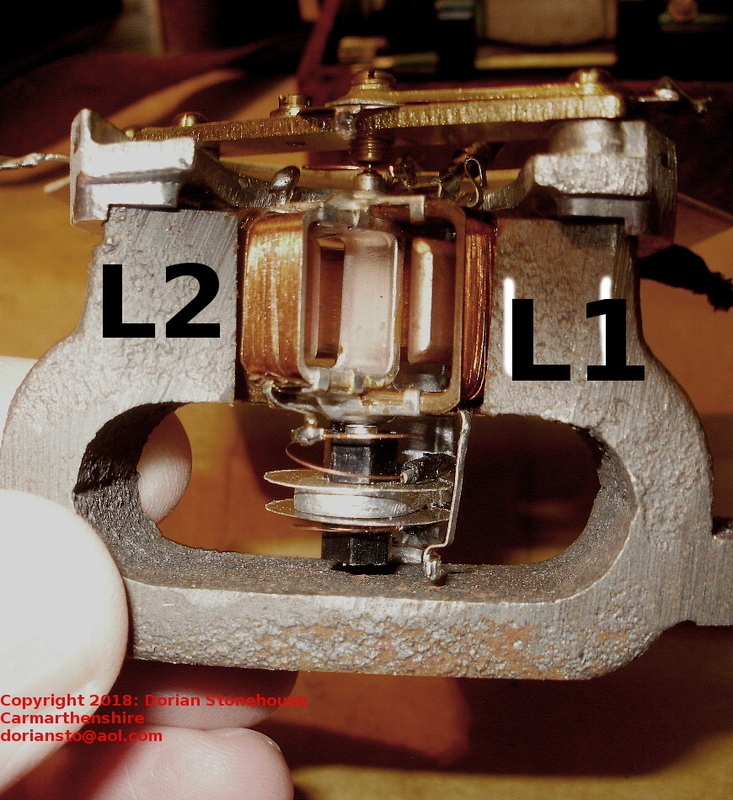 VL2 is, therefore, greater than VL1. Thus, VL1 cannot oppose VL2. The result is a hard swing to the right and a match win for VL2. 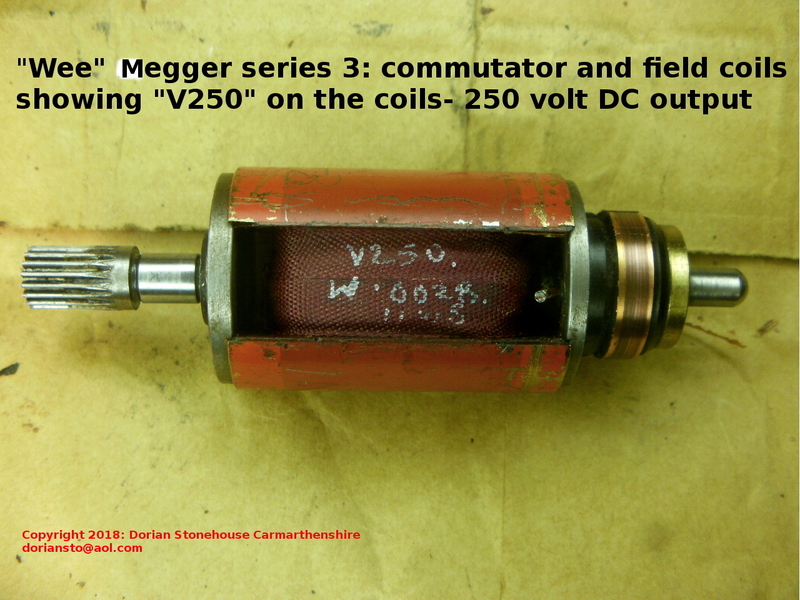 Third case scenario: what happens if your megger encounters a betwixt and between value resistor ? 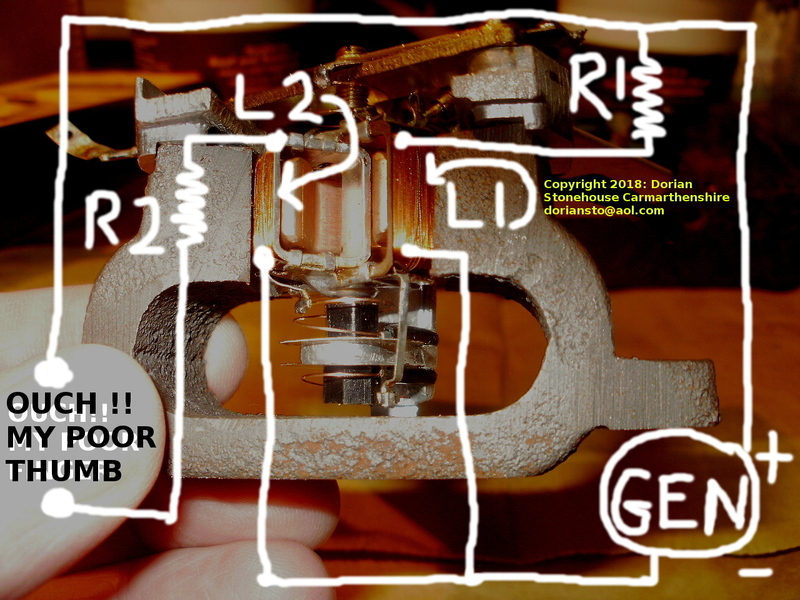 If there is a partial short circuit in the appliance under test, VL1 and VL2 will again produce opposing forces on the meter needle. 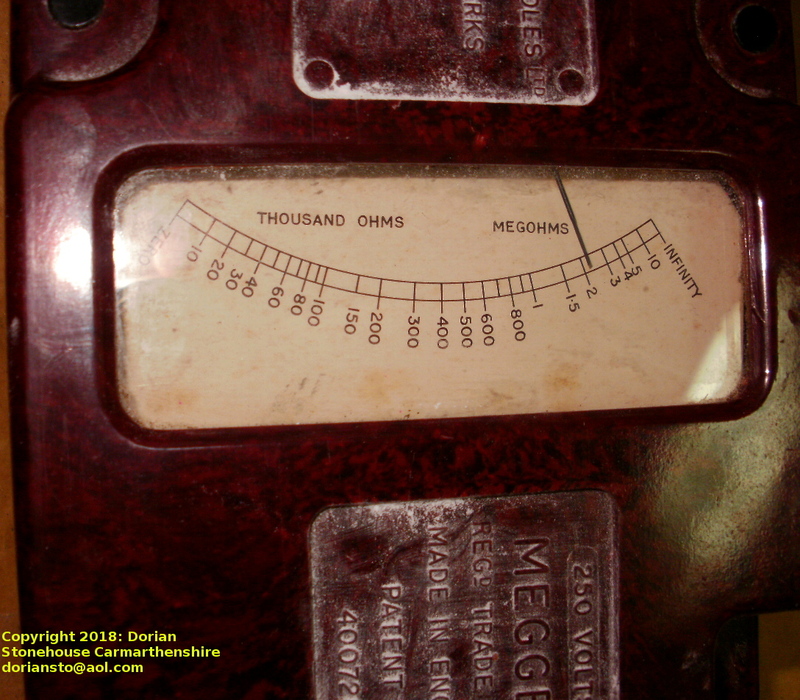 Reflecting the resistance of the defective appliance, the scale is marked in thousands, then millions of ohms, (see photo of megger scale). These generators were the Rolls-Royce of the electrical trade. 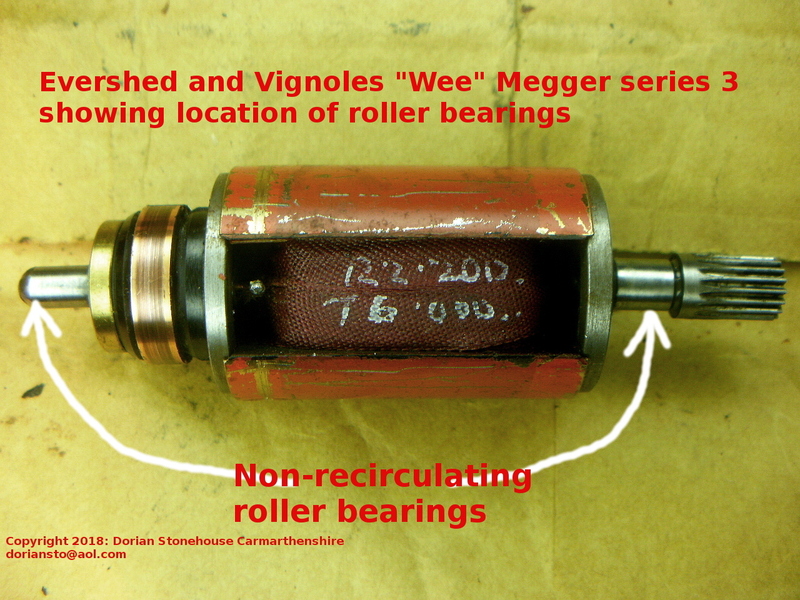 They were so well made, that many are still running like clockwork, more than 70 years later! 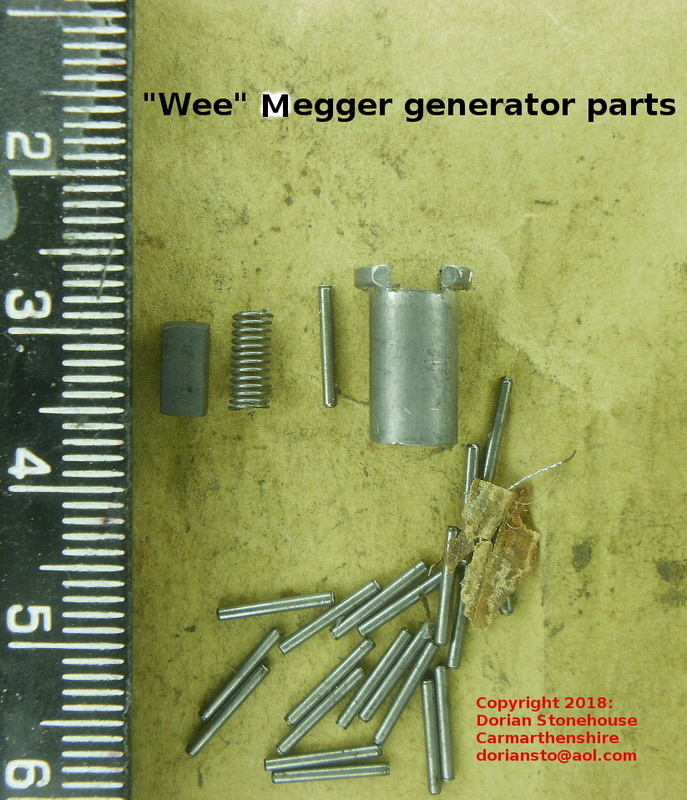 While grabbing the output terminals with one hand, I gingerly cranked the generator with my other hand. However, I felt no tingling sensation whatsoever, suggesting the presence of a fault – somewhere! 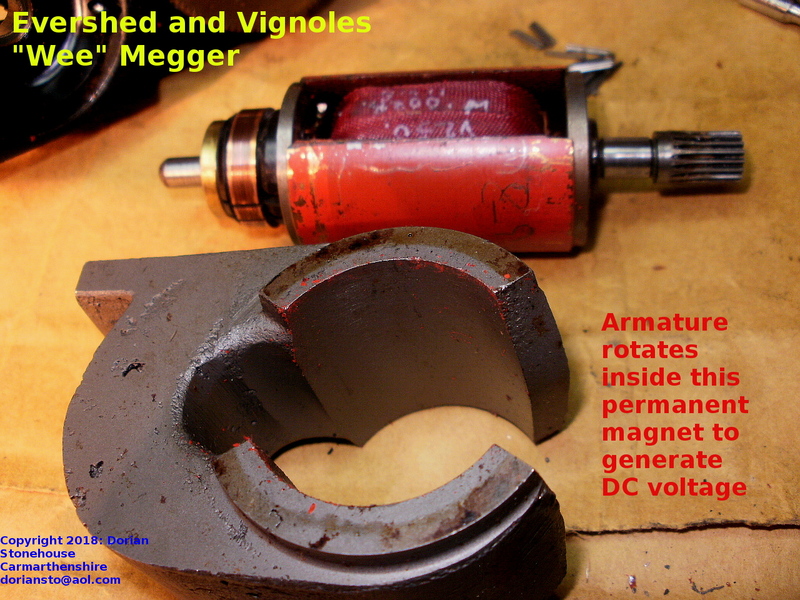 Working back towards the generator, it soon became apparent that the 250 volts had dropped to only 2 volts. In response to this situation, I decided to first check the brushes, but they appeared to be okay. 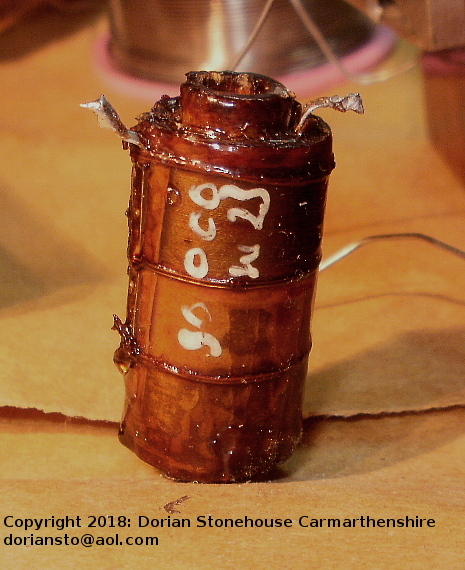 Onward and upward, I proceeded to measure commutator to commutator resistance. drat! – open circuit! 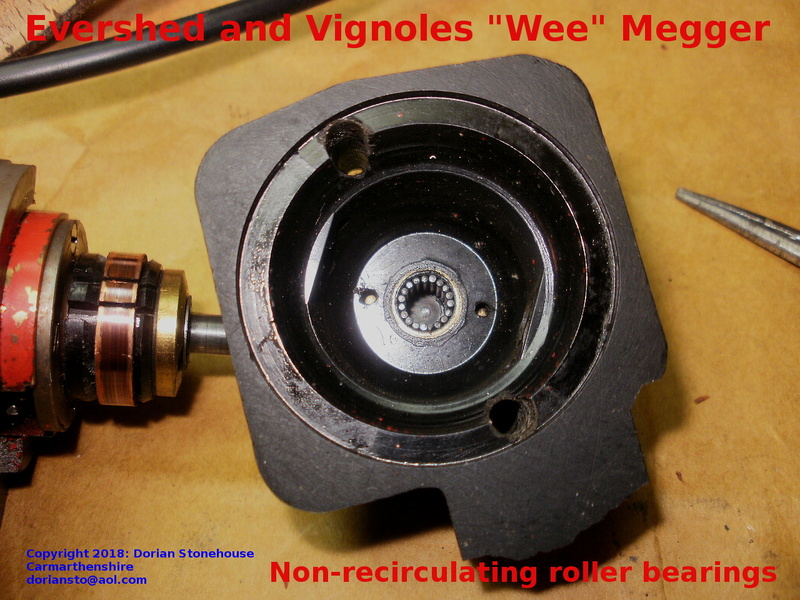 Off came the commutator housing – could it be the dreaded armature coil? 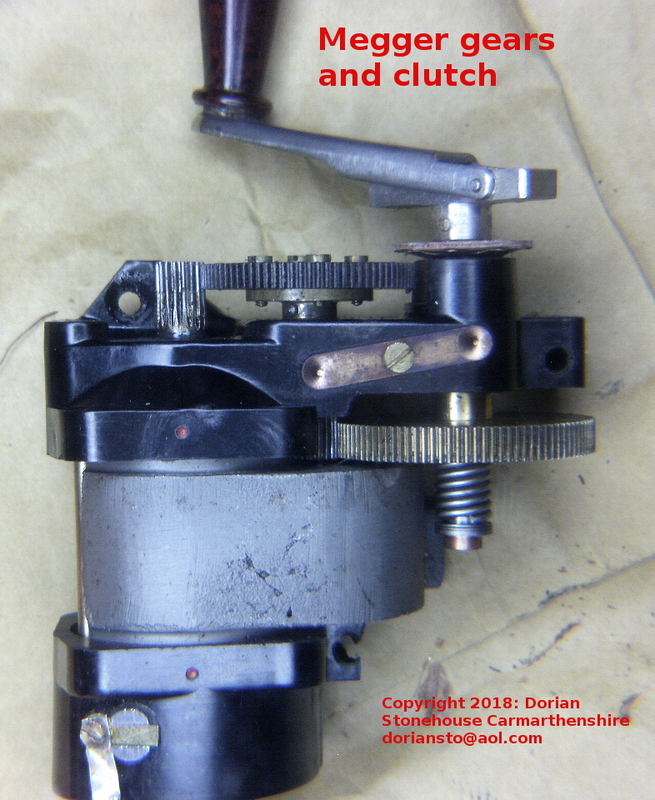 Suddenly, however, there was a glimmer of hope, as I could see what appeared to be a tiny break in one of the wires connecting the commutator to the coil! 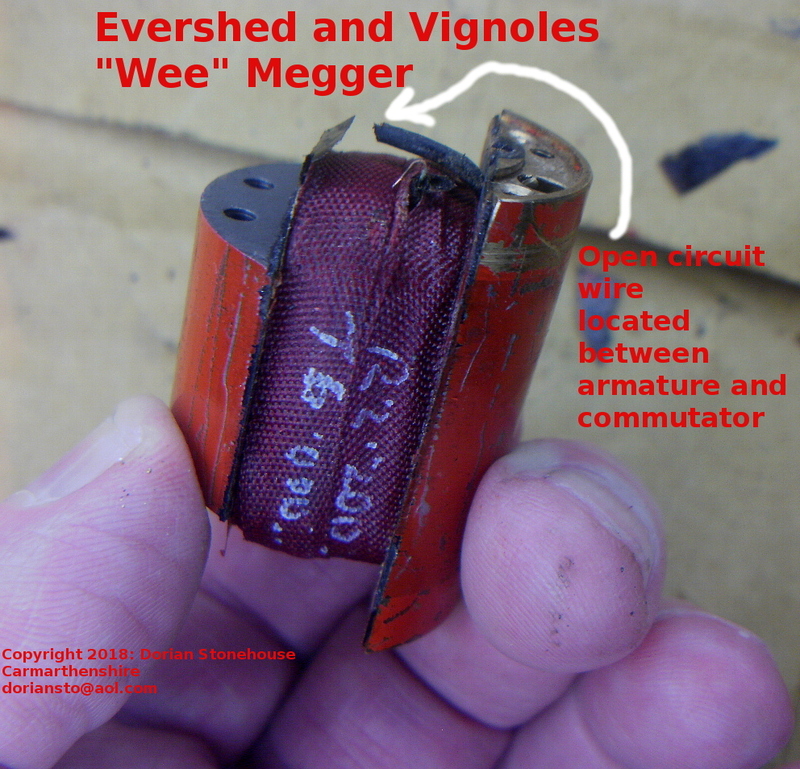 It transpired, therefore, that this wire was, indeed, open circuit, and that the armature coil was most likely intact. The break is shown in the photograph above. 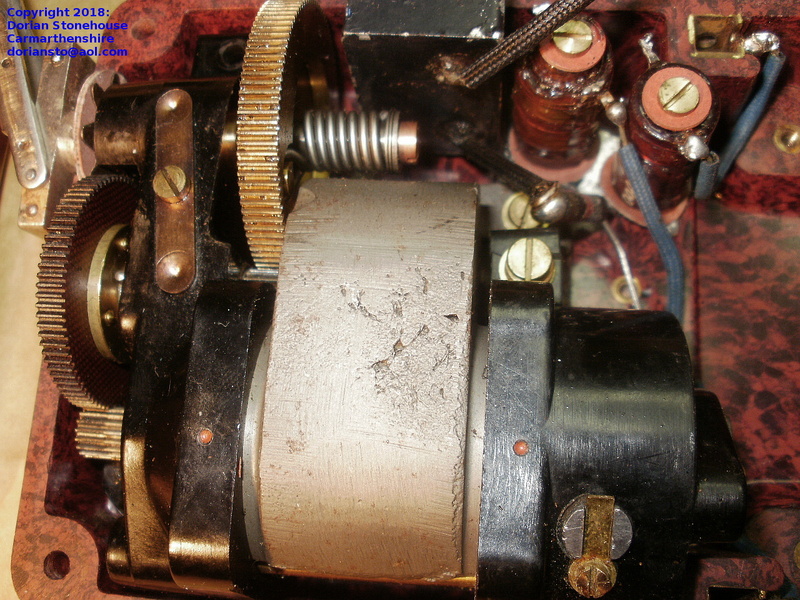 The coil to commutator repair was fairly straightforward, as was bolting everything back on the armature. 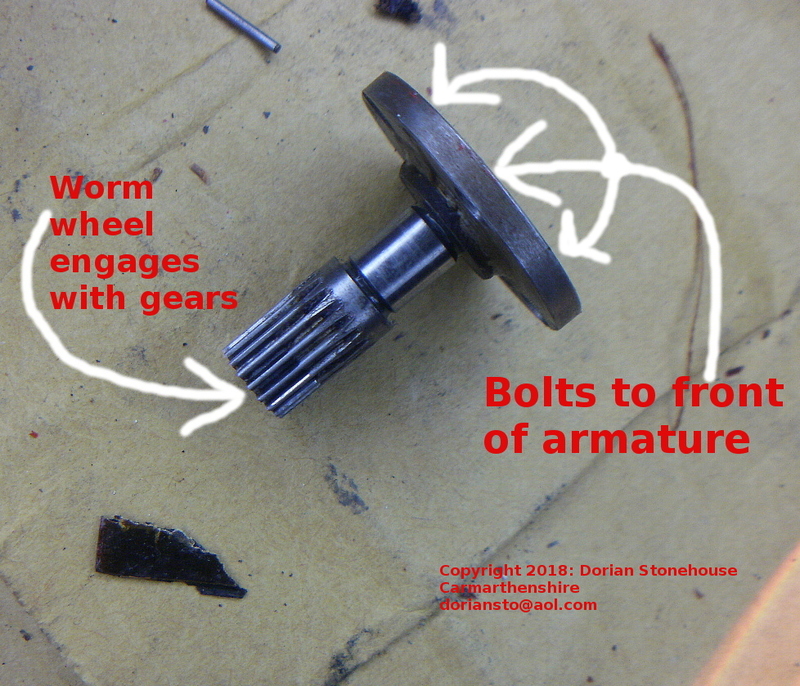 Before the armature worm wheel is pushed back to mesh with the gears, the roller bearings must be reinstated. 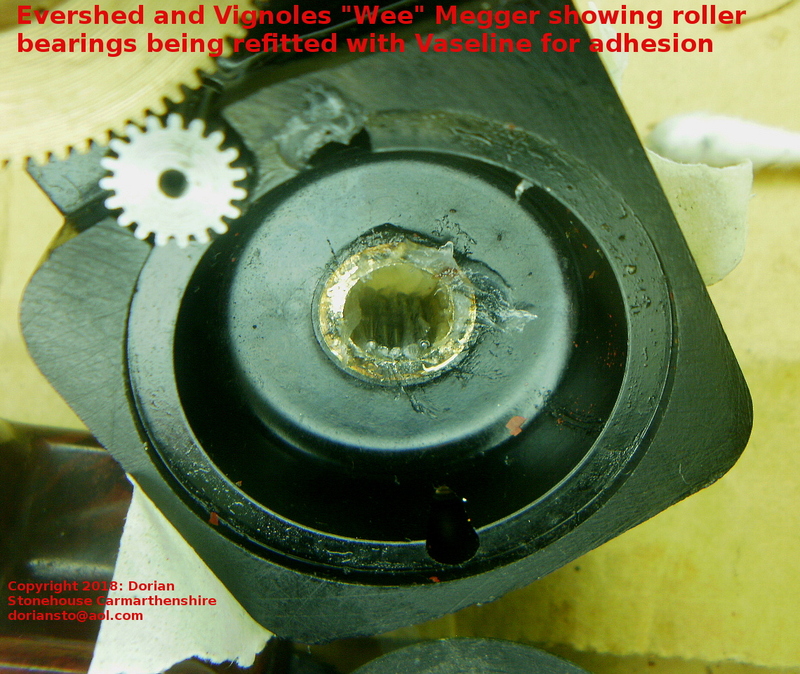 When removing and reinserting the armature assay, great care must be taken to ensure the roller bearings do not scatter everywhere and get lost, thereby destroying the chances of a successful repair! 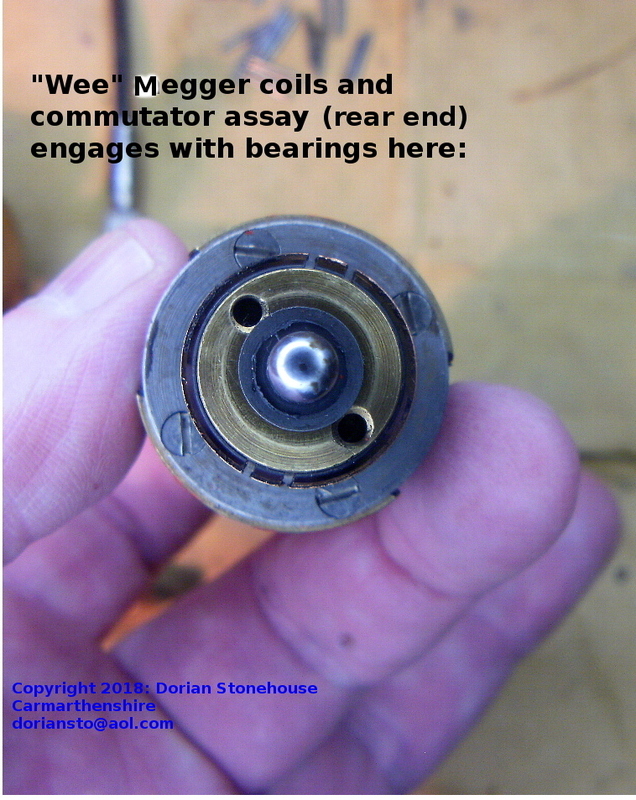 Slowly, slowly catchy monkey is the only way forward when dealing with the “Wee” Megger armature repairs! 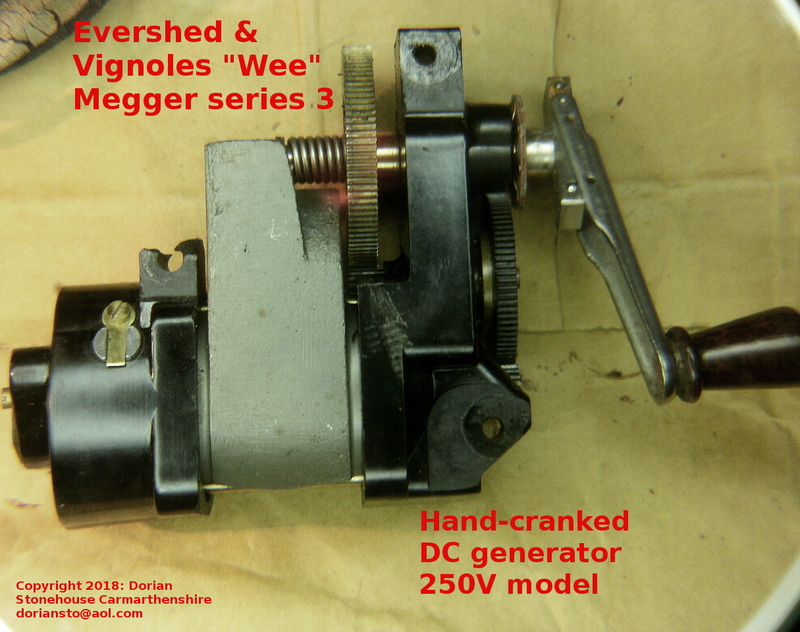 Having refitted the generator in the case, I carried out the tingling hand test once again: holding the output terminals with one hand, while cranking the generator handle with my free hand.